Louise Goodman presents the best of the action from the 2016 Dunlop MSA British Touring Car Championship, including the dramatic end to the season at Brands Hatch which saw Gordon Shedden claim the BTCC title for a third time. A full complement of 32 cars made the grid last season, with 11 different marques represented. The balance achieved between manufacturer-backed outfits and independent teams created superb racing right through the field and left pundits and fans alike guessing as to who would come out on top right until the very last round of the season. Indeed, 2016 was one of the most open, unpredictable and fiercely competitive seasons in living memory – as an unprecedented eight drivers went into the finale around Brands Hatch’s legendary ‘GP’ circuit still in contention to clinch the coveted crown. The momentum swung back and forth throughout the year, with no fewer than 12 different race-winners – another BTCC record – being testament to the championship’s perfectly balanced regulations and level playing field. Having suffered a variety of misfortunes mid-season, defending title-holder Shedden looked to be almost out for the count, but underscoring the mantra that nothing can ever be ruled out in the BTCC, the Scot dug deep and grafted his way back into the reckoning behind the wheel of his Honda Civic Type R. In the very last race of the year, he overhauled Sam Tordoff on the track to similarly overhaul him in the championship classification – in so doing becoming the first driver in almost a decade to secure back-to-back Drivers’ crowns. “In terms of entertainment, the BTCC has once again delivered in spades as the title battle went all the way down to the last race – and what a storming race it was!” reflected the Halfords Yuasa Racing man. “All year, I’ve really stuck my neck on the line and made some bold, heart-in-the-mouth moves that were on the edge more often than not. After Croft back in June, it looked like we were down-and-out, but we stuck to our guns, kept plugging away and gave it absolutely everything to claw our way back. It just goes to show that every single point really does count in this championship. Of course this was only part of the story so don’t miss ITV4’s blow-by-blow account on this incredible touring car season. 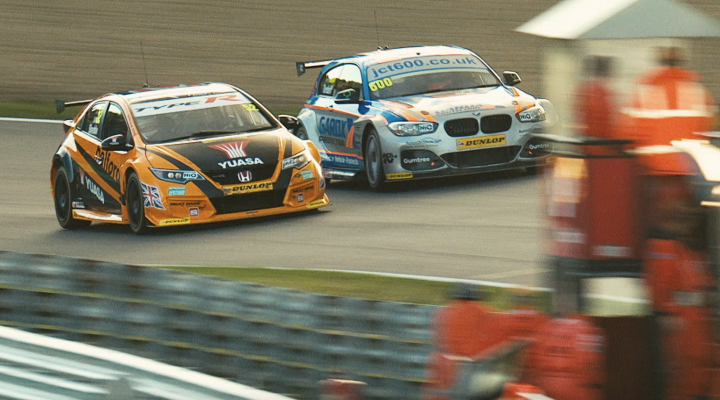 Catch the unmissable BTCC television treat at17:20 on Sunday 13 November.